Guest will find themselves in a trance when they encounter this creepy glowing skull. Its glowing red eyes and frigtening appearance will unsettle anyone that gets too close. Mystify your guests if you dare! Scary Skull features a flickering LED candle and an overall decayed finished for a creepy effect. At 8ft 6 inch tall the Skeleton Archway will dominate your Halloween scene. The Archway comes with (1) Skeleton, (4) Skeleton Hands, (4) Skulls and plenty of Spider Web material. 105 Warm White CUL LED Lights illuminate the scary arch for all guest to ponder the thought of entering. 140 Purple LED CUL Lights illuminates this spooky scene of 2 skeletons carrying a coffin. At 62.5inch high it makes for a great Halloween dicor piece in your scary yard. Made of sturdy metal framing and outdoor rated fabric materials. This eerie gothic gargoyle is the perfect watchdog to welcome and warn guests and/or invaders into your Home or Party this Halloween. High Level Sculptural Detailing and Painting, Top Quality MGO Materials, Piercing LED Lights, Spooky Sound, and Eerie Fog will impress partygoers of all ages making it an instant conversation piece. Battery Operated (Included). Volume Control. Looking for that unique item to complete your haunted home this season, this hatching baby Tyrannosaurus Rex is getting ready to unleash terror on unsuspecting passersby. A must have for the Halloween hobbyist or even for a prehistoric enthusiast. LED lights and sound effects complete this creepy hatchling. 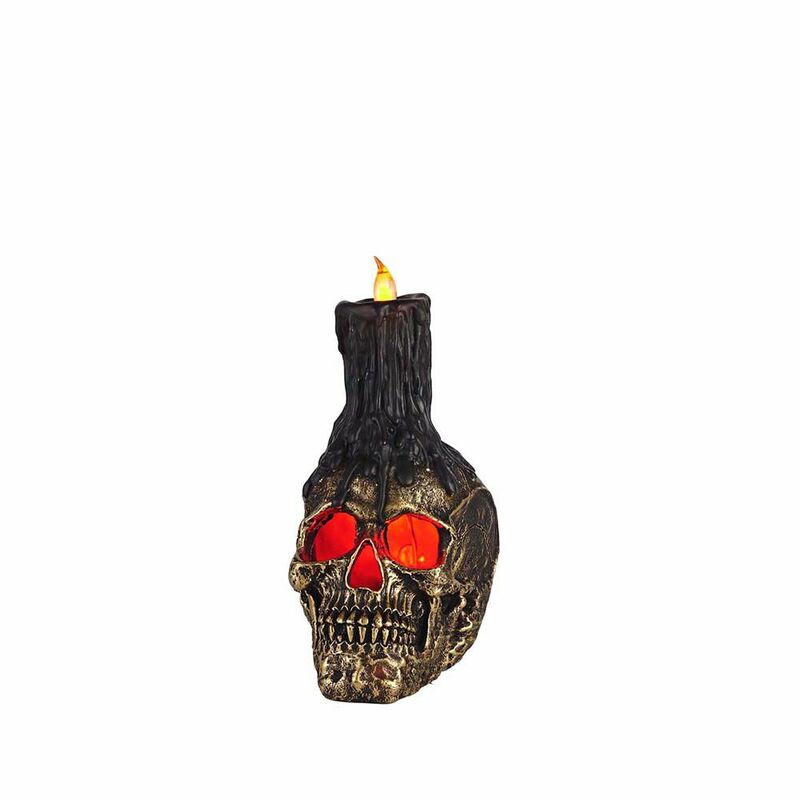 11-inch LED-Lit Skull Candle Halloween Decoration Guest will find themselves in a trance when they encounter this creepy glowing skull. Its glowing red eyes and frigtening appearance will unsettle anyone that gets too close. Mystify your guests if you dare!